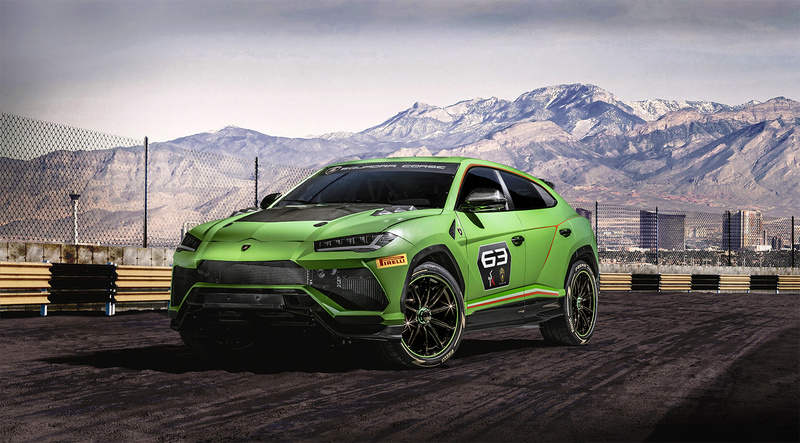 Lamborghini Squadra Corse unveiled the Urus ST-X Concept, the racing version of the first Super SUV in the brand’s history, during the 2018 World Finals at the Autodromo Vallelunga Piero Taruffi race circuit near Rome, Italy. Their vision is a car conceived for a single-brand championship that combines race circuits and off-road tracks. The new format will debut in 2020 in Europe and the Middle East on specially prepared FIA-approved circuits, with an ‘arrive and drive’ formula designed to offer driver-customers a complete package including car and technical support during each race weekend. Aesthetically, the Urus ST-X Concept is characterized by the matt Verde Mantis green livery in addition to the hood in visible carbon fiber. Larger air intakes optimize the cooling of the V8 twin-turbo engine that is capable of delivering 640 hp and 627 lb-ft of torque. The overall look is completed by the rear wing, the lateral racing exhausts with a new hexagonal design, and 21” single-nut aluminum alloy wheels fitted with Pirelli tires.